There are a lot of personal and professional qualities that come together to make a successful entrepreneur, and I think Kyle Donovan, creator of the iFork and a related line of flatware, glasses and plates, embodies many of those qualities. Sharing a little of his story can help shape your attitude, product or service and increase your chance to achieve outrageous success. Let me quickly outline the project that caught my attention. Kyle has developed a line of flatware that is about to be featured in 500 Wal-Mart stores. He has taken a product that humans have been using virtually unchanged for hundreds of years and given it a noticeable difference and distinct improvement. His iFork and related flatware sit on your table top without their “business parts” resting on the table. You see, our table tops – and tables in restaurants everywhere – aren’t the cleanest surfaces around. Kyle realized this when he was at an outdoor restaurant in Miami and watched a bird land on his table. His design solves this health and sanitation problem. Now that you have the basic picture, let’s quickly cover some points that will help us all become better entrepreneurs. Further, Kyle didn’t know very much about the plastic molding process, offshore production or marketing such a ubiquitous consumer product, so he had a lot to learn to bring his idea into production. With that being said, being a little unaware of the hurdles that lie ahead can be helpful. “Sometimes if you don’t know all the challenges, you don’t know how hard something is actually going to be, you’re already on the journey,” Kyle explains, adding that you learn as you go along and continue to make progress. You're never going to have perfect knowledge; you have to forge ahead anyway. As Kyle discusses all the challenges he has faced as he has worked to bring the iFork to market, it is obvious that he’s a man who’s not afraid of putting in a huge amount of effort when that’s required to get the job done. He credits his cousin for this. As they grew up in a rough part of Brooklyn, he looked up to his older cousin, who rose to the challenges life doled out at an early age. Kyle remembers his first foray into entrepreneurism: picking up bottles off the street for their redemption value. When he was just 19 years old, Kyle was working in a photolab and studio, and doing very well. However, he found out that another employee was making 25 cents more an hour and it didn’t seem right to him. That was all the motivation it took for Kyle to take charge of his own destiny. He started his own photo lab and studio. “I had a one bedroom apartment and my darkroom was my bedroom. For my studio, I had a mattress on the floor and I would lift it up and lean it against the wall and put a backdrop over it – that was my studio,” Kyle recalls. You’re at a party or perhaps an outdoor event with your plate of food in one hand and your drink in the other. You need a third hand if you actually want to eat. The iCup slips into a slot on the underside of the iPlate, firmly holding your food. Now you have that free hand. It also makes it easy for you to get a drink and plate of food for someone else and navigate your way through the crowd. Kyle currently has this project up on Kickstarter. If you check it out there, you’ll see a great video that makes a very strong case for the iCup and iPlate combination. 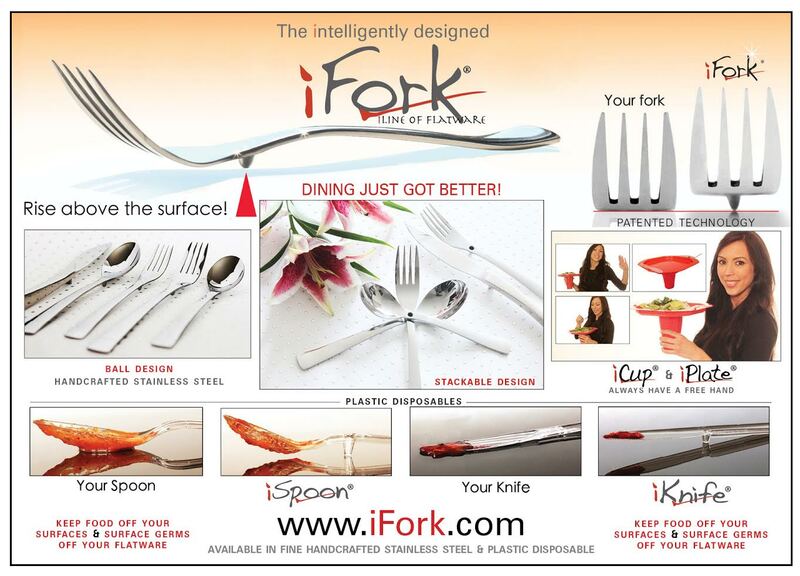 The tag line for Kyle’s iFork flatware is “Rise Above the Surface.” I think that entrepreneurs who demonstrate the qualities that Kyle has shown throughout his life will be able to join him and rise above the competition.